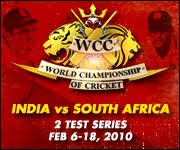 India takes on South Africa in a two test match series in the month of February 2010. Cricket Nirvana will be webcasting this series with live streaming, interactive scorecards, video highlights, news updates, images and many more. India currently is at the top of the ICC ratings for test cricket whereas South Africa is placed on number two. Hence this India Vs SouthAfrica Test Series is unofficially also known as World Championship of Cricket as the top two teams in Test cricket will fight for honour. The Indian cricket board announced on Monday that the Indian team for the test series will be announced on 28th of January 2010. South Africa will arrive on January 31 for two Tests and three ODIs against the home team. The first Test is at Nagpur from February 6-10 and the second and last Test will be held at Eden Gardens in Kolkatta from February 14-18. The three ODIs are scheduled to be played at Jaipur (February 21), Kanpur (February 24) and Ahmedabad (February 27).